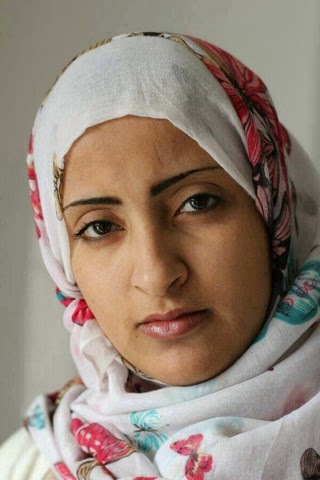 When a journalist is silenced by assassins, it is a crime against freedom of speech and humanity. It is deplorable and cowardly, and a personal violation to anyone who believes in the international rights of journalists to report. These acts of terror cannot and must not continue in Libya. Regardless of what and if he has any intentions later, at least one man, Heftar, has the guts now to do something about fighting these murderers. DOSHMA Container Art Gallery on University Road, Tripoli, Libya. 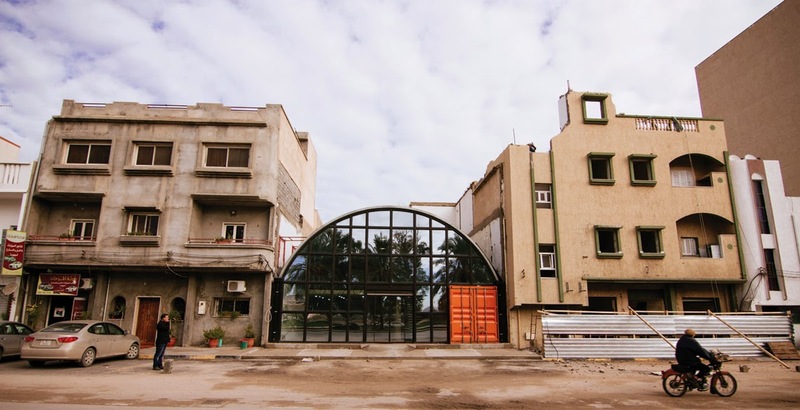 An incongruous arched structure with a bright orange door, metal roof and a front of unprotected glass stands out among a series of drab concrete buildings on Tripoli’s University Road. A café and art gallery unlike any other in the city, Doshma staged its inaugural exhibition, ‘The Forgotten Chatter’, in June 2013. Twelve emerging artists, some for the first time, shared paintings, photographs, sculptures and other pieces created during the past few years. ‘It was the first of its kind where contemporary art was shown in Tripoli in a modern setting,’ says Najla’a el-Ageli of Noon Arts, a private foundation that deals with organising exhibitions of Libyan artists in and outside of Libya. Breaking from convention in a big way, Abudajaja and his partner at Libya Design pursued a gritty material palette for Doshma’s construction, one that not only epitomises the revolutionary spirit that first inspired the project, but also mirrors their commitment to openness, transparency and collective freedom. The resulting space is comprised of a distinctive 40 foot reused shipping container that the Libya Design team says was previously used to transport goods during conflict, along with a double height arched aluminium shell and a fully glazed façade. ‘Seeing Doshma from the street already makes a statement,’ says Hadia Gana, whose ceramic installation ‘Zarda’ was displayed during ‘The Forgotten Chatter’ exhibition. 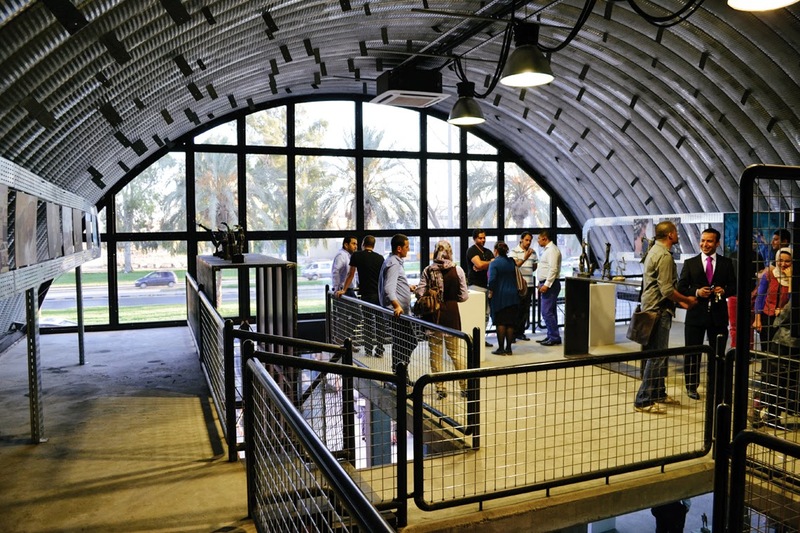 Unlike many repurposed shipping containers used in adaptive reuse programmes, this one, brought by truck from the edge of Tripoli, forms only a small section of the café and gallery – a tunnel of sorts that is set apart from the otherwise open plan space. Hanging areas and café facilities are tucked inside the monolithic volume, while the roof provides additional floor space at the mezzanine level. Both the design and the materials tell a story. 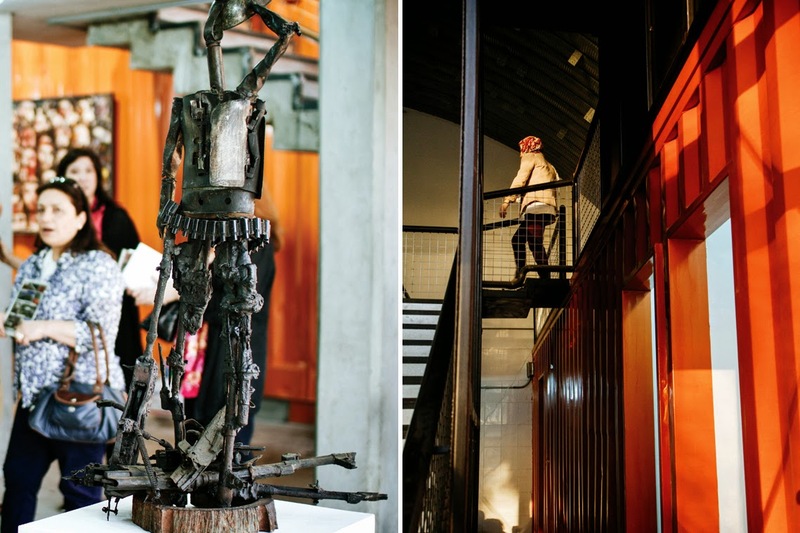 The metal container, unfinished concrete floors and black steel handrails honour the way found materials were repurposed during the city’s conflicts and lend a ‘back-to-basics’ vibe to the gallery. But the wide-open façade, which is free of any of the security barriers common found on typical residential and retail buildings in the area, sets the tone for a new future. ‘We purposely didn’t put any protection on the outside glass, as if to say to the people on the street, it’s time to not be afraid, to open up to the outside world,’ says Abudajaja. On a less profound note, all that glass and metal may seem deeply impractical in an arid, subtropical environment, but Libya Design used various passive design techniques to ensure a comfortable interior environment throughout the year. In addition to optimum site orientation that maximises shading and minimises excess solar gain, a chimney system evacuates hot air inside the building, of which only 35 percent has to be cooled. This slashes overall energy consumption and keeps operational costs low. Although using a fixed volume presented certain design challenges, Abudajaja says he looks forward to using shipping containers in future projects as well. By doing so, Libya Design can shift the materials dialogue away from concrete and mitigate the construction industry’s environmental impact. 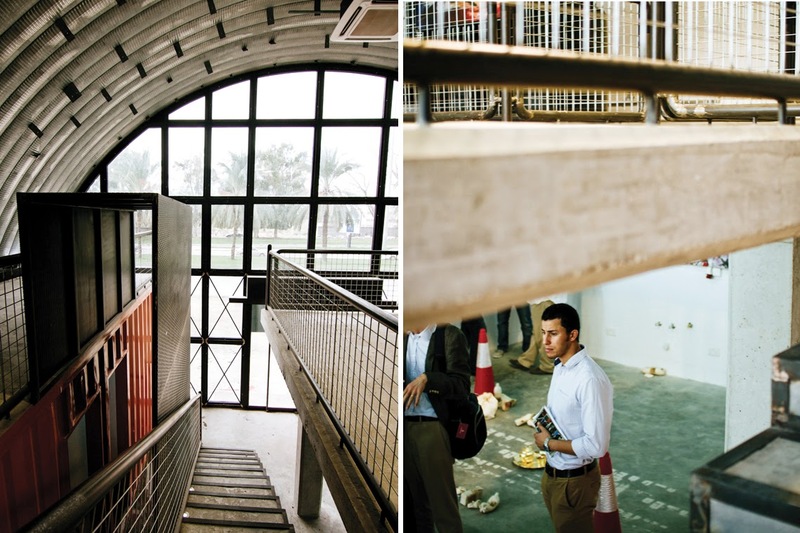 ‘All of the materials used – except for the steel roof – were sourced locally and reused,’ says Abudajaja, who credits the contractors HudHud for being so patient with a construction paradigm previously unexplored in Libya. ‘Without them, this project would have been impossible,’ he believes. In addition to using all local materials to avoid having to import them, HudHud spent extra time and money to train local, non-specialised workers to take part in the construction, which contributes to the overarching goal to make Doshma an open, welcome centre that not only serves the community, but also belongs to the community. Although Abudajaja and his Libya Design partner Walid El-Turki are currently managing the project, this won’t always be the case. ‘The next step is to leave Doshma, to let it become self-sufficient,’ says Abudajaja. Libya Design hopes that partnering NGOs will help with the logistics of running the space, like public relations, so that more people who are involved in the arts will know that it exists. In time, they plan to use roughly 40 percent of any revenue they make to support new artists. Who is General Khalifa Heftir? 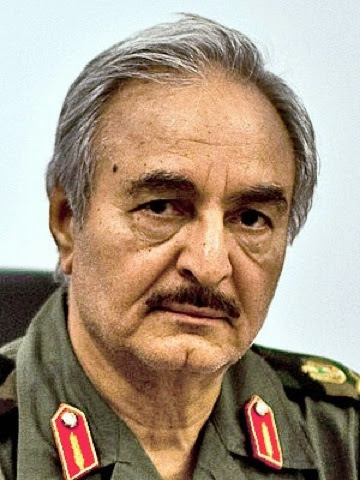 After being sentenced to death by Gaddafi and 20 years of living as a dissident in the United States, General Heftir felt compelled in 2011 to return to Libya at the beginning of the Libyan Revolution, to help depose Ghaddafi. 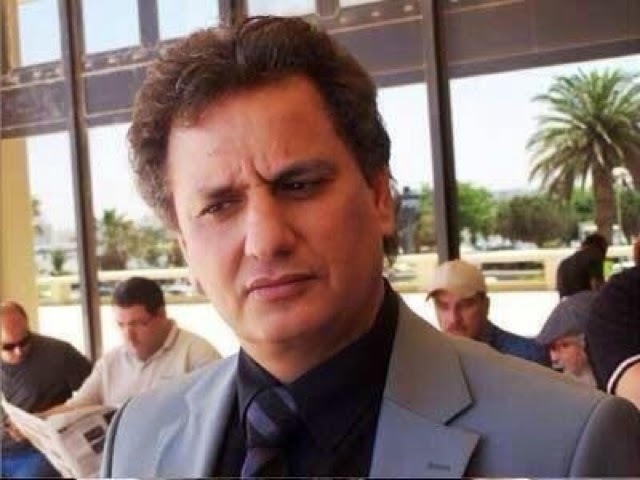 With his strong military background and support from the rebels, Heftir was successful in taking charge of the military campaign, finally helping the rebels free Libya of Gaddafi's ruthless dictatorship. In the past 4 years following the Revolution, the political and socio-economic situation in Libya has gradually declined. The militias who once fought together for a common cause fragmented, each one wanting to be rewarded in one way or another for their role in the revolution. Added to that, Islamist extremists, who went underground or were imprisoned during the Gaddafi years, emerged in large numbers with alarming violence. Thuggery, kidnappings and assassinations became the norm in the lives for Libyans who had anticipated democracy and freedom after Gaddafi. The elected government, or GNC, has been weak, and impotent or unwilling to combat the threats and actions of certain militias and extremists, who are heavily fortified by weapons left over from the revolution. Benghazi, in eastern Libya, has suffered the most from certain groups, in particular the Ansar Al-Sharia. In addition to being the group linked to the assassination of Ambassador Stevens and three American personnel at the Consulate, they have also been involved in many assassinations of Libyans as well as foreigners. Once again, the man who had once fought one enemy, has emerged to lead a campaign against the Islamists of his hometown, Benghazi. This is General Kalifa Heftir.